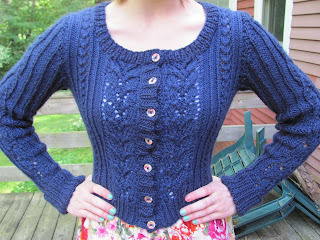 I used Caron Simply Soft worsted weight yarn and I bought the buttons online at lotsofbuttons.com. Best button website ever. And I would know because I like to shop for buttons on the internet in my free time. I'm very happy with this cardigan. I don't really have much else to say about it. It's adorable, it fits well, and it was fun to knit. 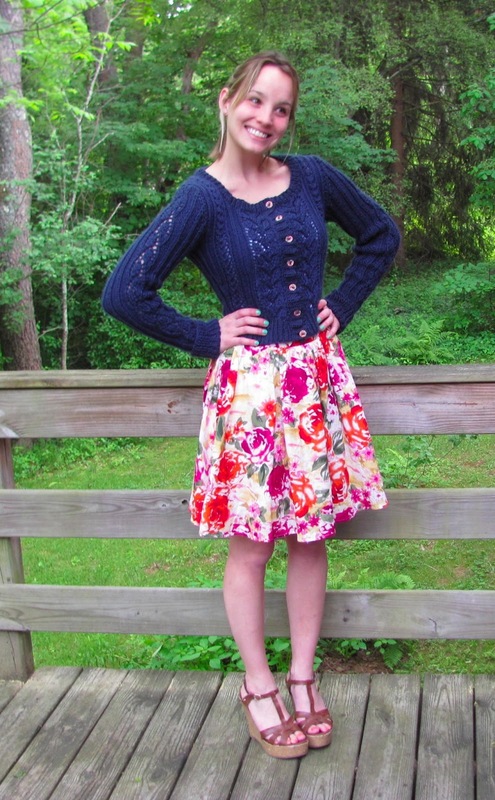 Andi is a terrific knitwear pattern designer; her designs are all so cute and the directions are well-written. I started this cardigan in September. I finished the body in a reasonable amount of time and decided to take a break and practice using double pointed knitting needles before I started the sleeves. So I made a pair of socks. And then a few hats....and then another sweater. I pretty much waited until it finally warmed up in Massachusetts to finish this cardigan. 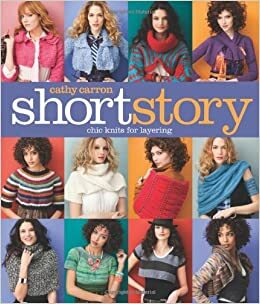 And now I'm on a knitting kick, so there will be lots of sweaty pictures of me modeling knitted garments in the next few weeks. Get stoked. I don't know why my face looks like that. But this is the best picture of the sleeves. So onto the internet it goes. in Erin of I Heart Fabric's Copy Cat Challenge? I won the second prize! $30 to Jo-Ann Fabrics! This is wonderful news seeing as how that's where I spend pretty much all the money I earn from working there. So a big thank you to Erin! As if I needed another excuse to be obsessed with her blog.